I was so excited when I found out that I was having a girl four years ago. I could imagine dressing up my little Princess in the most beautiful outfits and accessories. But when she was two years old, the only thing that she wanted to do was wear her brother’s clothes. What? Thankfully just a year later she suddenly decided that she was indeed a Princess and so began my love affair with dresses, tights and pretty hair accessories. When I discovered Loulou Tutu on Etsy, I was like a kid in a candy store. 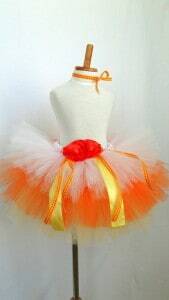 The first tutu that caught my eye was the “Candy Corn” Princess Tutu. The colors were so vivid and combined with the handmade flower bow this tutu just appeared to pop onscreen. Little did I know that as beautiful as the tutu was onscreen, it was nothing compared to the tutu in real life. In fact, I have purchased numerous special tutu’s for Hannah over the years and the tutu that I received from Loulou Tutu is hands down the best quality and most beautiful that I have ever owned. 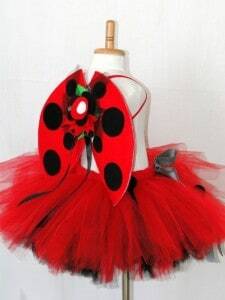 Loulou Tutu is the creation of Jenny Loustaunau and came about after she had to design a Halloween tutu for herself. She began by practicing making a child’s tutu and her work became so sought after that she started her own Etsy store featuring tutus, hair accessories, purse accessories and embellished clothing. Jenny is a military wife and stay at home mom of two boys who puts her heart and soul into every tutu and accessory that she designs. 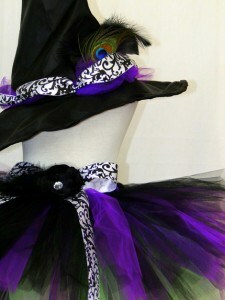 The options at Loulou Tutu are almost limitless for your Princess on Halloween this year. What I really appreciate is that not only would these make excellent Halloween costumes but are so diverse that the tutus can be worn afterwards for dress up or a special occasion. My own daughter would be happy to wear her tutu anywhere, including the ball field or the park. You just have to look at these amazing Halloween tutu’s with matching accessories. The Flower Pixie Halloween Costume and accessories including fairy tulle tiara headband, pom pom ribbon wand and wireless fairy wings are so magical. I was shocked when I saw that the price for the entire set was only $62.95. I have paid almost as much for a store bought costume and this is completely handmade and designed so that no two sets are alike. The Little Miss Ladybug ($56.95) is my absolute favorite Halloween costume from Loulou Tutu but hurry this one is almost sold out. Check out the Good L’il Witch costume complete with matching hat and wand…it is too cute. 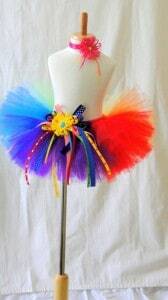 Finally, you have to see the adorable Rainbow Clown Tutu which is so bright and cheerful that just looking at it makes me smile. Don’t see exactly what you are looking for? Just send Jenny a message because she will also do custom orders to make your tutu and accessories perfect. 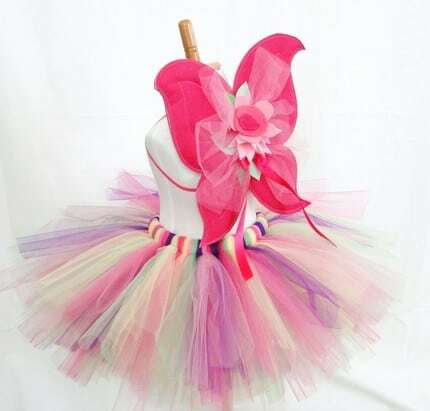 To purchase any of the tutus that you see here hurry over now to Loulou Tutu’s fabulous tutu’s and accessories! These are so pretty…thanks for sharing. Those are soooooo super cute!!!!!!! I’ve been eye-ing them myself. We’re having our first baby- a girl!- this winter! How exciting for you!!!! Your little girl will be here before you know it!